1840s: Large decorative combs carved from tortoise shell were very popular. Earlier in the decade daycaps were worn by young and old, but later in the decade only by older women. Bonnets were close to the face early in the decade and later changed to a more circular shape that rested further back on the head. Ears were covered until the end of the decade. 1850s: The daycap was not for streetwear, rather just for invalids and elderly women at home. Godey’s fashion sketches show caps of fine lawn with puffed crowns and wide sheer lappets falling at either side of the face, edged in lace or embroidered in whitework, and hanging free. Bonnets are wide and roundly open, curling under the chin, and set far back on the head by 1853, underbrims plentifully decorated. 1860s: Early 1860s bonnets were high and spoon shaped, becoming smaller later in the decade. Smaller hats and bonnets were worn high and central, with wide ribbons hung down the back. Hair was rolled under to chin length and held in place with crochet, knotted ribbon, or “invisible” (made of hair) hair nets. 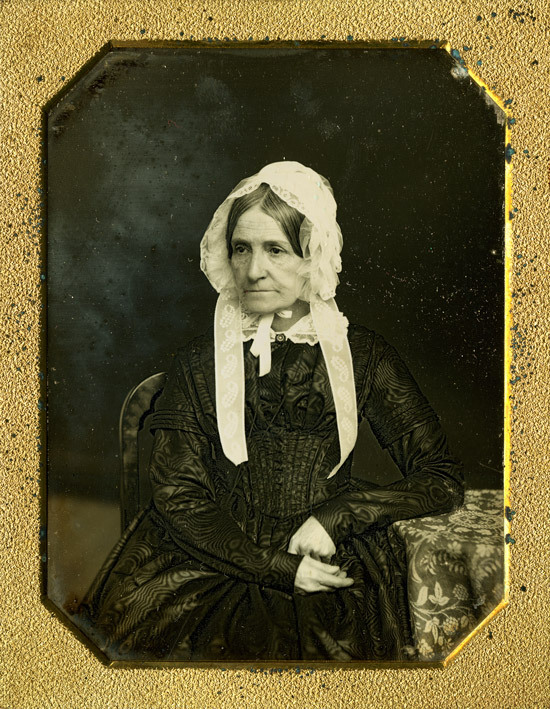 Frances Lea Smith wearing a bonnet. 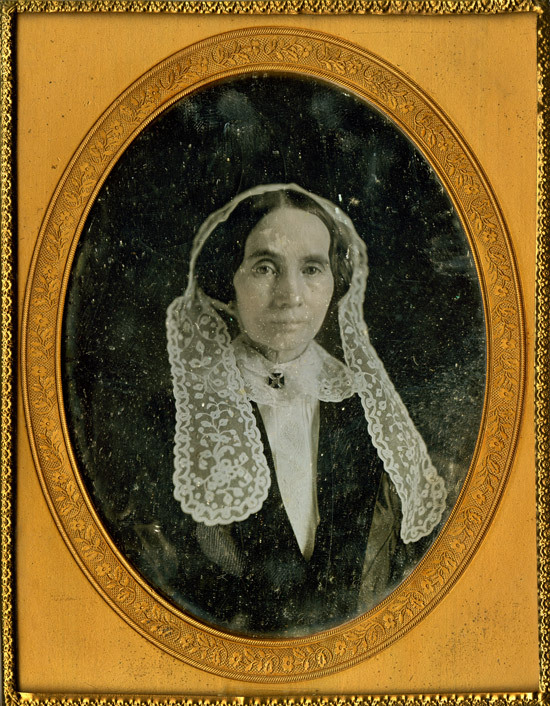 Enlarged reproduction of a 1/6 plate daguerreotype, circa 1848. 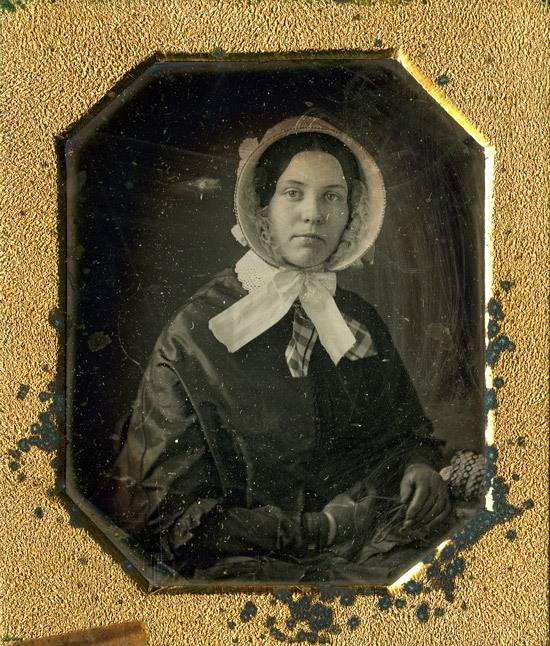 Elizabeth Graff (Murphey) Townsend wearing a bonnet. Enlarged reproduction of a 1/6 plate ambrotype, circa 1858. Woman wearing a decorative tortoise shell comb in her hair. Enlarged reproduction of a 1/6 plate daguerreotype, circa 1849. Seated woman wearing a daycap. 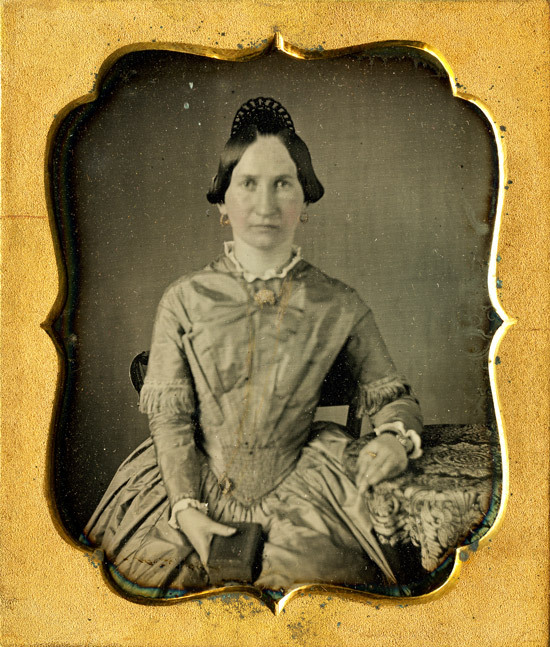 Enlarged reproduction of a 1/2 plate daguerreotype, circa 1843. Charlotte Frost Godfrey wearing a daycap with wide sheer lappets embroidered in whitework. 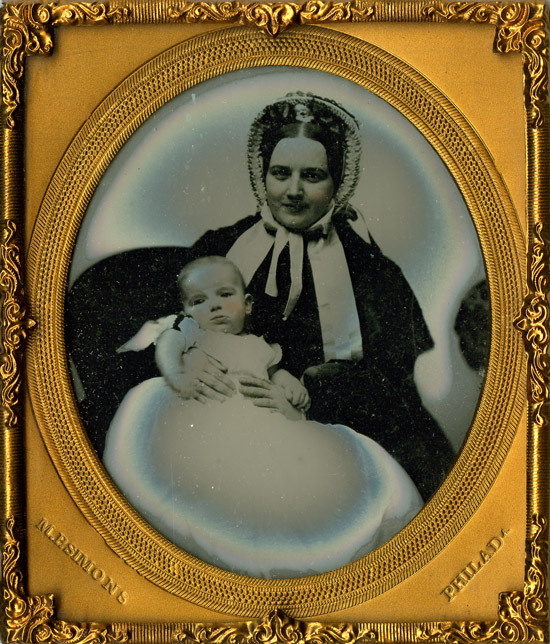 Enlarged reproduction of a 1/2 plate daguerreotype, circa 1851. 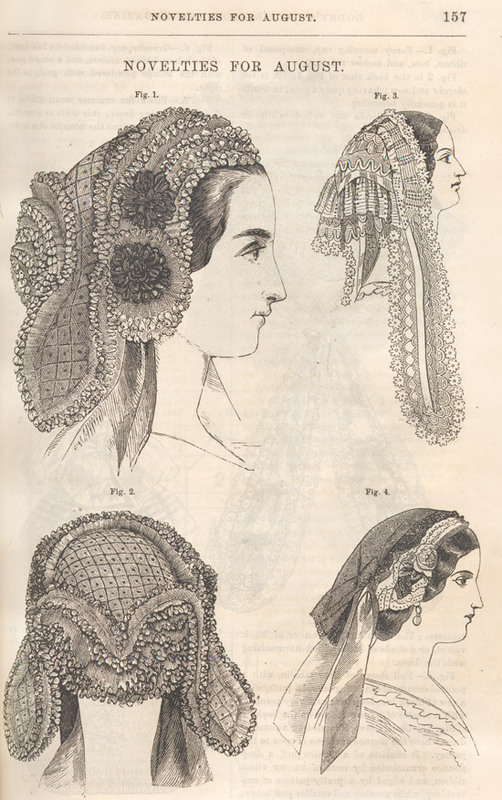 Illustrations of four ladies caps. Reproduction of page 157 of Godey's Lady's Book, Vol. 61, 1860.